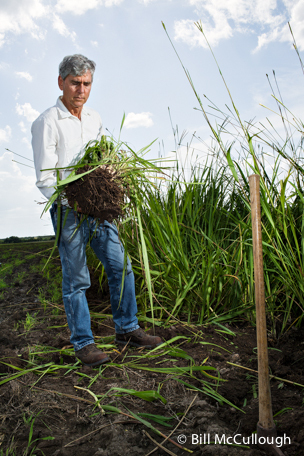 Nurseryman Bill Neiman harvests native seed to restore Texas prairies. As a child growing up on the rural outskirts of Dallas in the 1950s, Bill Neiman loved to plant himself beneath the native horse apple trees in his family’s backyard. Water hose in hand, he created rivers and lakes for his imaginary little people in the make-believe cities he built in the dirt. The young Neiman spent summers barefoot, walking through pastures to explore the tall grasses around Bachman Creek and Bachman Lake. He dug in the dirt with his grandmothers, nurturing vegetable gardens and flowerbeds. As a teenager, Neiman traveled yearly with his father to New Mexico’s Gila Wilderness, where they slept on the ground, made hot tea from wild mint and seasoned freshly caught trout with watercress, nuts and berries. By Neiman’s 19th birthday, the seeds of destiny that someday would yield the operations of his Native American Seed farm and a partnership with the Texas Parks and Wildlife Department had clearly been sown: He would work with land, plants and water. In 1973, Neiman borrowed a rake, a shovel and a lawnmower to start a landscaping business in Argyle, northwest of Dallas. Five years later, in neighboring Flower Mound, he launched a bigger operation: Neiman Environments Nursery and Landscape Construction Company. But by 1985, at the age of 30, Neiman was questioning everything about his business. Haunted by a brutally hot 1980, when his non-native landscapes succumbed to drought, Neiman realized he was growing the wrong kinds of plants. The surrounding countryside was virtually covered with alien species. No one, it seemed, knew where to find native vegetation. Grasses and flowers line the fields at Neiman's Native American Seed farm. Disconnected from his childhood roots, Neiman was at a crossroads. The turning point he desperately sought came on March 30, 1985, during a native plant landscaping seminar held in Dallas at the Texas Agricultural Research and Extension Center, which was locally known as the Renner Station. Hosted by the Native Plant Society of Texas, formed four years earlier, the seminar featured keynote speaker Sally Wasowski, an author whose first native landscaping book was set for release that April. Neiman sat alone near the top row of the auditorium confronting a painful truth: Everything about his role in the conventional American landscape paradigm, every non-native species that he planted in a customer’s yard, every drop of water that went toward keeping insanely thirsty exotics green for green’s sake, was a mistake. On the stage below, Wasowski challenged the audience: Where could native plants be found? Who could be trusted to grow them? Shocking even himself, Neiman sprang to his feet. Wasowski had never heard of Bill Neiman. Bill Neiman examines eastern gamagrass. “We all looked at each other and thought ‘Who is this guy, and will we ever see him again?’ ” she recalled in a phone interview. The answer was yes. Neiman kept his word, completing his nursery’s conversion to native plants by the late 1980s. Wasowski, who went running to get Neiman’s name after the seminar, became one of his first customers. The transition wasn’t easy. Neiman and his wife, Jan, dug up native plants and roots from Denton County sites being paved over by urban sprawl. They hand-collected native seeds to grow starter plants. And they bought an old church bus, removed its seats and traveled to Central Texas, bringing home native plants from visionary nurseries. Their efforts were producing amazing results. In the morning, Neiman and his crew would deliver native plants to a customer’s home for landscaping. That afternoon, before the men had finished cleaning up, bugs, birds and butterflies were already zooming into the yard, wildly attracted by the new vegetation. There was no doubt in Neiman’s mind: There was a crash in habitat. Wildlife was starving for native plants. Nearby, a few pockets of wild prairie remained where native seeds could be harvested. Neiman figured that in the back of a pickup truck, he could load enough native plants to landscape a yard in an afternoon. Or, in that same pickup bed, he could load enough bags of harvested seeds to plant 40 acres. The future was at stake. 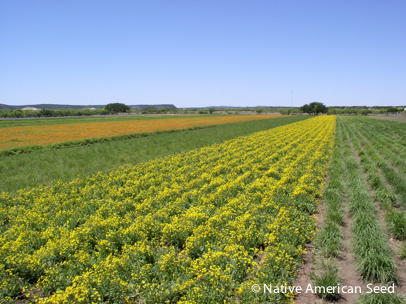 Neiman resolved to start restoring Texas’ native prairies. Otherwise, genetic information would be lost. The seeds were the only things holding it. In 1988, Neiman pulled an Allis Chalmers combine with a Farmall Super M tractor to harvest Flower Mound’s 12-acre namesake, The Mound, sacred Native American ground cloaked with 350 native plant species. Neiman had a new offering: an ecosystem in a bag. That same fall, he introduced the business name Native American Seed, selling seeds in Mason jars. Annual winecup seeds in the hands of Bill Neiman. In 1989, in a project funded by TPWD, the Nature Conservancy and Collin County, Neiman conducted his first native prairie restoration, planting seeds he harvested within a 15-mile radius on 60 acres of the Parkhill Prairie Preserve. He could rebuild an ecosystem from itself. The next year, Neiman shut down his Flower Mound nursery, moving full-time into harvesting seeds on native prairie remnants. In 1995, Bill, Jan and their children, Emily and Weston, ages 12 and 6, moved to the Hill Country, eventually establishing a permanent home for Native American Seed on a farm northeast of Junction on the Llano River. Seated at the intersection of a handful of Texas’ 10 ecoregions, Native American Seed specializes in the harvest and sale of wildflower seeds and prairie grasses native to the Texas-Oklahoma-Louisiana bioregion. As a research laboratory for seeds harvested off-site, the farm provides vivid examples of how native habitat sustains wildlife. During the extreme drought conditions of 2011, clouds of painted buntings descended on rows of Texas cupgrass (Eriochloa sericea), surviving on its nutritious seeds. Milkweed varieties grown on the farm support migrating monarch butterflies, whose numbers are plummeting these days. 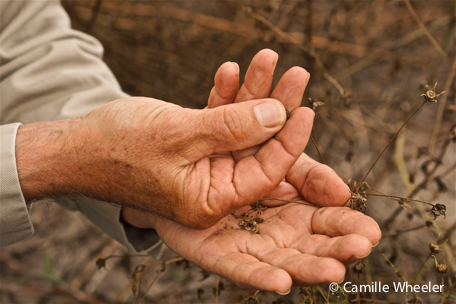 The Native American Seed story is one of connections, with none more critical than Neiman’s collaborations with TPWD. Through harvesting, prairie restoration and educational outreach, Native American Seed has provided help to dozens of state park facilities over the past 27 years. Two such partnerships continue at the Houston-area Sheldon Lake State Park and Environmental Learning Center and at San Jacinto Battleground State Historic Site, where TPWD biologist and natural resource specialist Andy Sipocz strategizes with Neiman’s team. Since Neiman’s initial visits to Sheldon Lake State Park in 2004, Native American Seed’s work, in part, has involved wetlands restoration via the planting of live roots into marshes. And in cooperation with the Texas A&M AgriLife Extension Service, the U.S. Environmental Protection Agency, the U.S. Fish and Wildlife Service and Texas Master Naturalist volunteers, wetlands covered up by agricultural land use decades ago are being re-excavated with the “Sheldon-Sipocz” method that Sipocz pioneered. Sheldon Lake State Park’s intricately connected wetlands and prairie need many more years of recovery, Sipocz says. Yet the swift return of wildlife to the park is “like magic,” says Sipocz, who again is seeing American bitterns and bobcats, among many other animals, thriving in tall native grasses. 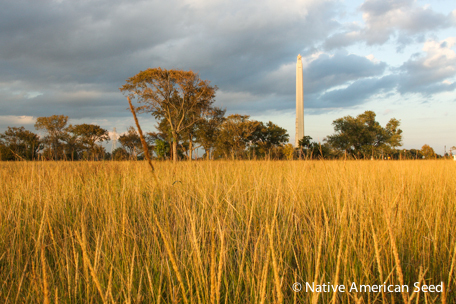 Bill Neiman has been helping restore the tall-grass prairie at the San Jacinto Battleground. In nearby La Porte, the San Jacinto Battleground Conservancy, the Shell Oil Company and Texas Master Naturalist volunteers are providing support for the restoration of the San Jacinto Battleground to its 1836 appearance, when Texas soldiers crawled through waist-high native grasses to take Mexican Gen. Santa Anna’s encampment by surprise and seize the decisive victory of the Texas Revolution. In 2013, Native American Seed meticulously planted a mixture of native grasses and wildflowers on 110 acres of the site with a tractor and seed drill. The size, scope and precision of Neiman’s convoy-traveling operations set the team apart. “It’s not easy planting prairie soil. That’s why we use folks like Bill,” Sipocz says. Neiman, now 61, encourages us all to read the land: to understand what grew there 150 years ago without human interference.